It’s been six days since our last recruiting news post, and, not surprisingly, a lot has changed in the recruiting landscape around the state of Ohio. As predicted, another Ohio senior has made a commitment to a Division I school, while several rising juniors have seen spikes in their recruitment with new visits, offers and interest coming out daily. Here’s the latest recruiting news from around the Buckeye State…. Carlik Jones – ’16 Cincinnati Aiken PG: Jones became the latest Ohio senior to commit to a NCAA D1 school this past weekend when the 6’0 point guard committed to Radford. A Big South conference school out of Virginia, Radford was one of the first schools to offer Jones in July, after the point guard opened the evaluation period with a bang at the Adidas Gauntlet Finals in Atlanta. A smooth point guard who fits the past-first mold, Jones chose Radford over Bowling Green, Northern Kentucky and some other low to mid-major interest. Quinton Dove – ’16 Euclid PF: Dove burst onto the scene as a 2016 to watch after a strong spring with TNBA on the circuit; however, this was met by confusion, as no one had seen him play the past three years at Cleveland Villa Angela-St. Joe’s. Well, Dove is now enrolled at Euclid, and promises to be a key piece for new head coach John Harris when the season starts this winter. A 6’7 forward with excellent athleticism, length and upside, Dove should be one of the top prep players in the Northeastern part of the state this coming year, should he be able to continue to improve his academic standing. While his grades will greatly impact his recruitment, Dove did get his first NCAA D1 offer this past weekend, as Buffalo reached out and extended a scholarship. Xavier Simpson – ’16 Lima Senior PG: Last week we wrote about the influx of offers for Ohio’s top 2016 point guard, while this week it’s all about visits for the Lima Senior product. Simpson took the first of his official visits (NCAA allows up to five) this past weekend, when he and his father traveled to the campus of Iowa State. The Cyclones have been recruiting Simpson for some time now, and even though former head coach Fred Hoidberg is now coaching the NBA’s Chicago Bulls, the new ISU staff still views Simpson as their top point guard target in the 2016 class. Willie Jackson – ’16 Garfield Heights SF/PF: This athletic forward ended his summer in style by attracting interest from several high-major programs; and now it is time for Jackson to decide which schools interest him the most, as the 6’6 athlete begins to set visit dates. As of now, Jackson has plans to officially visit both Boston College and Missouri in September, according to Garfield Heights head coach Sonny Johnson, but schools like SMU and Temple also could receive visits before a final decision is announced. Derek Funderburk – ’16 Cleveland St. Edward PF: After months of speculation, word became official yesterday that former Cleveland St. Edward power forward Derek Funderburk, an Ohio State commit, will leave the Buckeye State for his senior year and attend a prep school. The most likely landing spot for Funderburk is probably Montverde Academy in Florida, where fellow Ohio native and 2016 OSU commit Micah Potter (originally from Mentor) will prep as well. Regardless of where he ends up, we can confirm that Funderburk is no longer enrolled at St. Edward, and will definitely pursue an out of state option. 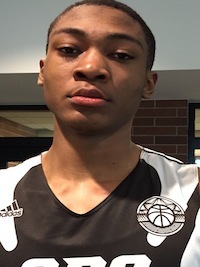 Derek Culver – ’17 Warren Harding PF: Ohio’s top 2017 prospect, in our eyes, had a big recruiting week as the 6’9 forward visited one prestigious Big Ten program and received a new scholarship offer from another. Culver took an unofficial visit to West Lafayette, Indiana, over the weekend to visit Purdue’s campus, while shortly after he received a scholarship offer from the Boilermaker’s in-state rival, Indiana. Head coach Tom Crean has certainly shown more interest in Ohio, offering 2016’s Ibi Watson (who has since committed to Michigan) and Xavier Simpson, and the Hoosiers head coach must have his eye set on continuing that trend into the 2017 class. Schools like Purdue, Ohio State, Xavier, West Virginia and Illinois were among those that were most visible at Culver’s games this July, as the rising junior forward is likely to have an extremely busy recruitment over the next two years. Derek Koch – ’17 Salem Northwestern PF/C: Koch added his second NCAA D1 offer this past week, as Oakland University joined Toledo as the latest mid-major school to offer the powerful 6’7 post player. Schools at both the mid and high-major levels are also showing interest in Koch, as West Virginia, Iowa and Akron are among those who tracked him heavily in July with DB Hoops. AJ Gareri – ’17 Akron Ellet PF: Another DB Hoops player who has seen his recruitment pick up, Gareri added an offer from Toledo this past weekend. The Rockets offer is the third NCAA D1 scholarship option for Gareri, who also lists Kent State and Ohio University as school who have extended offers. Like Koch, Gareri is being recruited some at the mid and high-major levels, as his versatility offensively as a skilled 6’8 forward is certainly intriguing enough to make him one of Ohio’s elite rising juniors. Correy Long – ’17 Cincinnati Hughes PG/SG: Since receiving an offer from NCAA D1 school Bethune-Cookman during the first July evaluation period, Long’s name has steadily received more and more buzz this summer. Reporting interest from almost a dozen NCAA D1 schools, Long has the eye of almost all of the regional mid-major programs, and is now in the process of setting up some unofficial visits. According to his high school program, the 6’3 combo guard will visit Ohio University and Evansville in the near future, with Evansville being reportedly on the verge of offering after Long performed well at their team camp back in June.